The New Design that changed the shape of things to come. a) The backbone of the tractor or central unit consisting of the engine, clutch gears etc. protected by a waterproof casing instead of the usual chassis. b) The motor axle at the back with 3 ratio transmission all encased. c) The unit at the front consisting of the fuel tank taking the shape of the bonnet and the cooling radiator right at the front of the tractor. 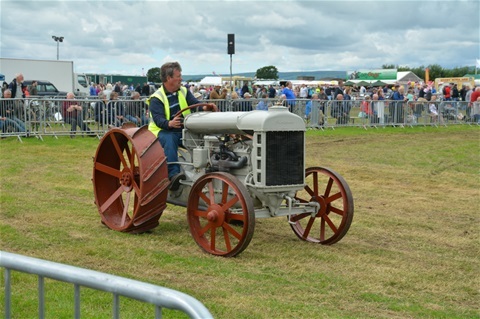 This concept was then copied by all other tractor manufactures. The new design was lighter than most other tractors on the market and more compact. 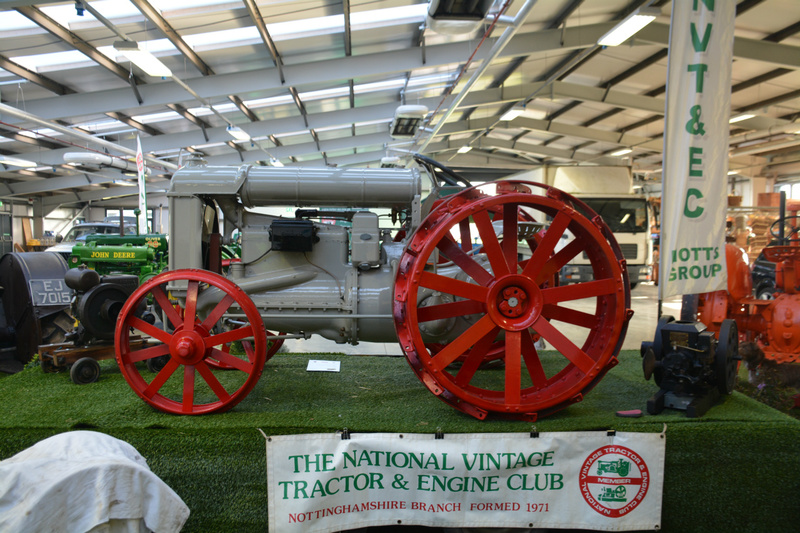 This design was far and away ahead of all the other tractor designs and was also superior in terms of its better power to weight ratio. Because Ford used mass production techniques the price was also lower than its competitors. This initiated a price war in the USA amongst the main tractor producers. The model F was designed by Charles Sorenson and Eugene Farkas. Farkas, a Hungarian, was Henry Ford’s chief engineer and Sorenson, Fords right hand man. Henry Ford started his career by producing Ford motor cars. In 1901 he set up the Ford Motor Company but this didn’t succeed and in 1903 he got a new set of partners and started a new company which gradually became more and more successful leading to the model T Ford car being produced in 1908. However, as a lad he was brought up on a farm. His father was an immigrant from Ireland and built up a 120 acre farm. Henry, his eldest son, resented the tedious hard work on the farm. He wanted to reduce the drudgery of farm work by devising a machine that could take away some of the donkey work that farmers and labours had to perform. Ford with the help of Sorenson and Farkas experimented with several tractor designs built on a frame or chassis. The other directors of the Ford Motor company had problems with all the money that was being spent on Fords experiments with tractor design so he set up a new company called Henry Ford & Son to take over the design and production of his new farm tractor. The only shareholders in the new company were Henry, his wife and his son. Ford bought an old brick yard in Brady Street, Dearborn, Michigan, USA which was near a rail line. He then built a new factory there, put Charles Sorensen in charge tractor development. Eugene Farkas was head of the design team with instructions to design a tractor that was simple, reliable, not too heavy but at the same time having adequate power and easy to assemble on a production line with the cost kept as low as possible. Farkas came up with the 3 unit construction, getting rid of the traditional chassis-a unique design at the time. Several prototypes were made and tested on Fords farm land which was nearby. The light weight, compact and 3 unit design proved to be very good. WW1 broke out in 1914 and by 1916 Britain was running short of food due to the attacks by German U-boats on ships bringing imported goods. In May of 1916 The Ministry of Agriculture introduced a long term plan to convert 3 million acres of permanent grassland into arable land to boost food production. There were 2 big obstacles to this though because the ‘call up’ had depleted the farms of both labour and horses. Tractors were needed to replace horses but they weren’t very many to be had. British tractor production hadn’t really taken off and most factories were producing things for the war effort. The agricultural machinery section of the Ministry of Munitions (MOMs) was set up in January 2017 with the aim of increasing home production of tractors and coordinating imports. Selwyn Francis Edge was the director and the head of the Ford Motor Company (cars) in England Percival Perry was an advisor. Now Perry knew about Fords tractor development in the USA and imported one of the precursors to the Model F to be tested by MOM in England. MOM found the tractor (model X) performed really well in field trials. Ford was persuaded to allow production of the tractor in the UK but the cost was going to be too high here and there were limited resources to be able to build it so Ford offered to supply to MOMs 5000 tractors made in the USA at $700 each. (In England the cost would have been $1500.) 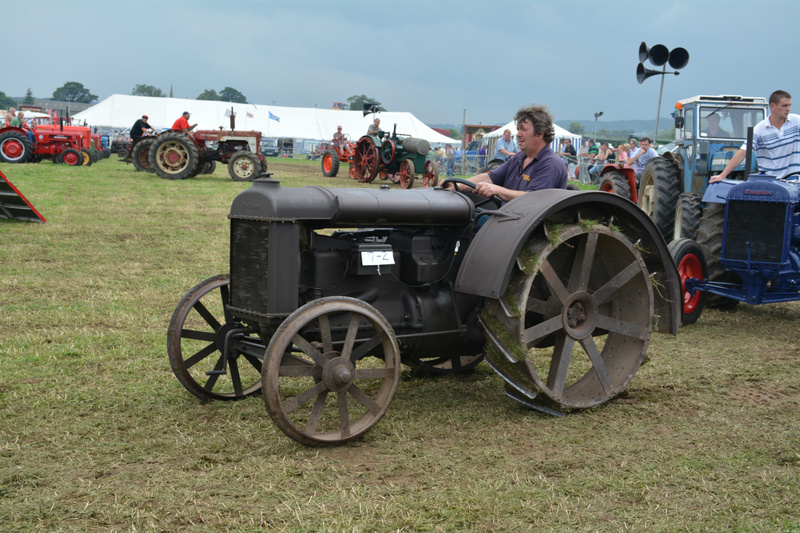 The first tractors didn’t have the Fordson name on them and were known as MOM tractors. In 1918 it was given the name Fordson, an abbreviated way of saying Henry Ford and Son. 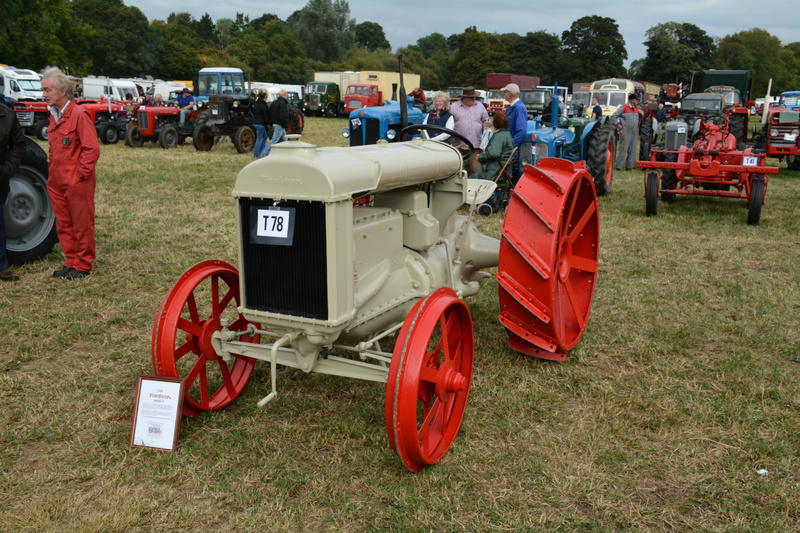 By the end of 1918 7000 tractors had been made-now the Fordson Model F. This model enabled Henry Ford and Son to become the leading manufacture of tractors in the USA (and the world), out producing the previous leader the International Harvester Company. In 1919 57,290 Model F’s were produced—a record number of tractors for any manufacture. This record was broken again in 1920 having produced 70,885 Model F’s. International Harvester found it difficult to compete. There designs were old fashioned and more expensive. A price war broke out. 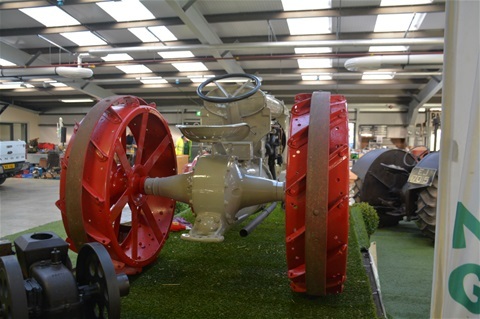 This tractor helped save Britain from starving during WW1. The model F imports helped to replace the man power and horse power lost to the war effort and aided the cultivation of once permanent pasture to produce food for the home market. The light weight, compact, 3 unit design proved to be very popular indeed and most tractor manufactures copied this design when they produced new models. The Decline of the Fordson Model F.
A recession leading to lower demand for new tractors started in 1920. 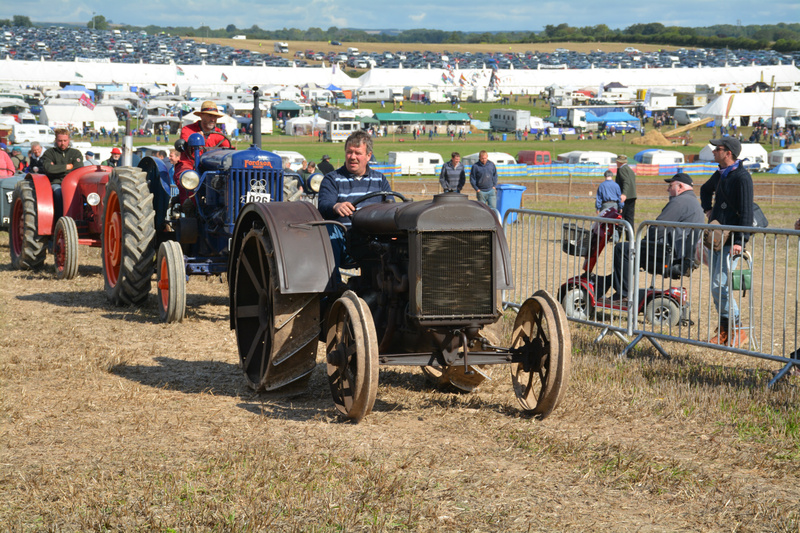 The Fordson Model F was still the best seller but numbers were well down on previous production. Fordson reduced the price to $625 and eventually down to $395 which was the minimum amount that would produce a little profit. Production of the Model F was moved to a new factory which could produce them more efficiently at River Rouge, Detroit, Michigan. This helped to keep the price competitive with other makes. From 1920 to 1926 the Soviet Union became the biggest buyers of the F. they also put a copy of the Model F into production between 1924 and 1932. In the late 20’s the once revolutionary design of the Model F was becoming out dated compared with other tractor manufactures who had introduced new models and in 1927 IH regained their number 1 position with their Farmall. Case also proved strong competitors. In 1928 Fordson Production was concentrated in the Cork factory (Ireland) because labour costs were cheaper here. Model F’s were also made in Cork, Ireland from 1919 to 1922 and many were sold in Manchester. Not everything was good with the model F.
The braking system wasn’t really good. In 1920 the Nebraska University trials found that the pulling performance of the Model F was lower than 60 tractors tested. There was a problem with early models with the tipping point because of a mass imbalance. In some circumstances, when using reverse gear, the Model F would rear up on its back wheels and tip over. This led to the death of several farmers. It was put right by fitting large rear fenders which prevented the tractor tipping over completely. First made...............1917 and continued to 1927. Predecessor............. None. It was Fords first mass produced tractor. 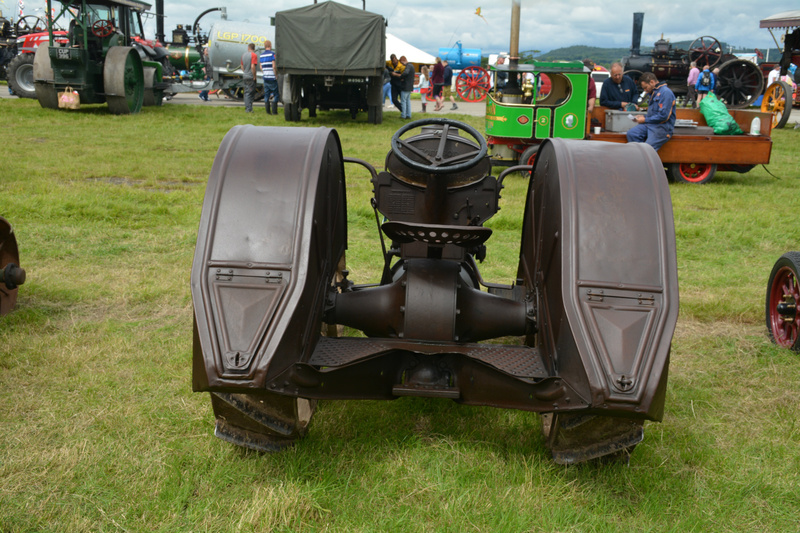 Weight...................1325kg (light compared to the usual tractor designs of the day). Power....................20hp pully and 10hp drawbar. Engine....................Hercules then the Ford 4 cylinder petrol paraffin.